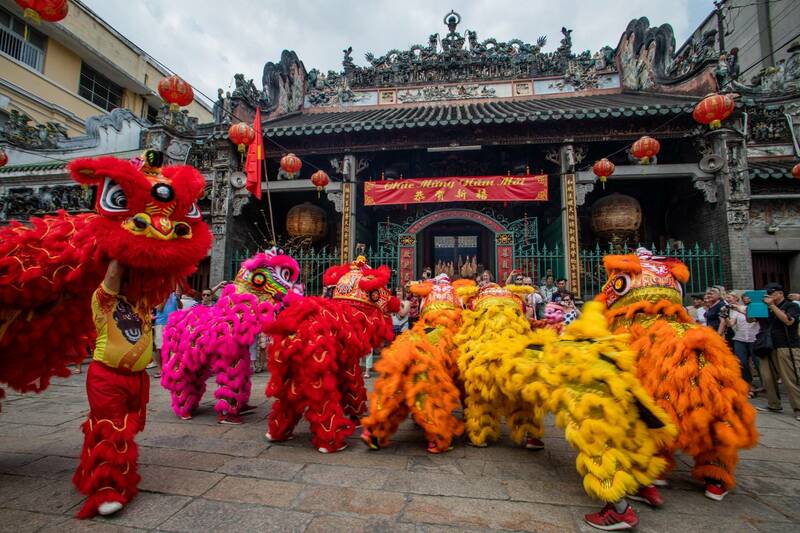 Dozens of lion dance troupes generate an electric Tet atmosphere at the Thien Hau Pagoda in District 5. The lion dance is an important ritual of the Lunar New Year celebrations, believed to usher in good luck for all ventures. 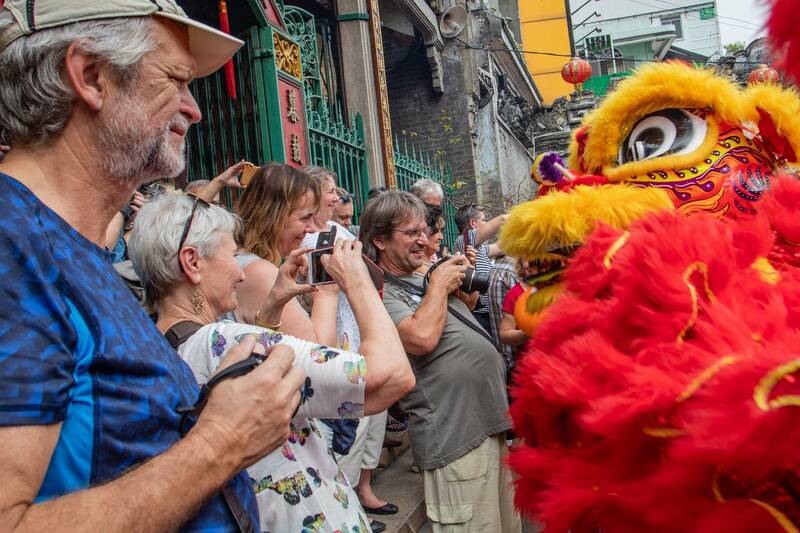 And every year, lion dance troupes from across the city gather the Chinese-style temple dedicated to Thien Hau, the Lady of the Sea just hours before New Year’s Eve to pray for good luck from the Goddess before they go on performance tours across the city. 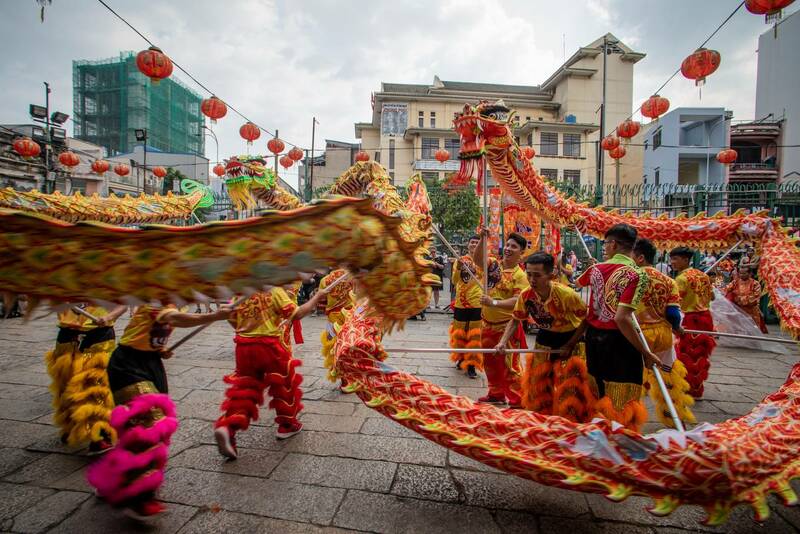 For the Chinese community and Vietnamese people, the lion and dragon dances are an indispensable part of Tet and other important festivals and events. 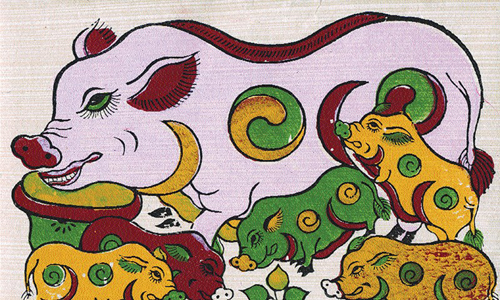 The dances dispel evil and bring luck and success, it is strongly believed. 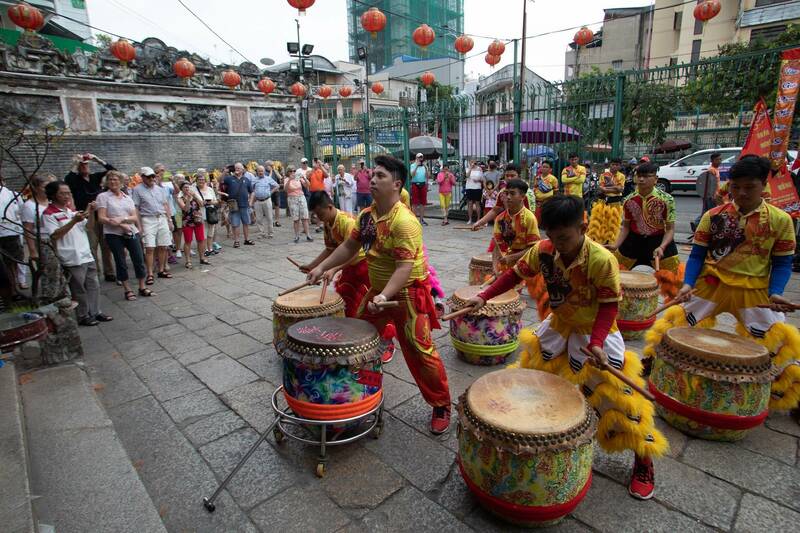 More than 20 members of Van Chai lion dance troupe in District 1 beat traditional drums. 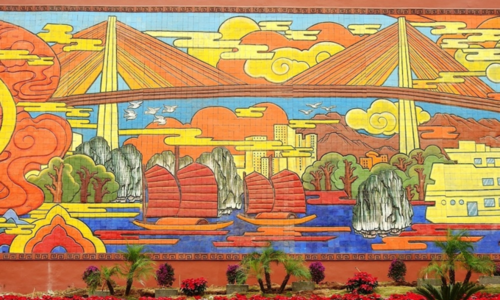 “Every year, we come to this temple before New Year’s Eve to burn incense for the Goddess and pray for luck and success before starting a performance journey that lasts until the 15th day of the first lunar month, known as Tet Nguyen Tieu (Lantern Festival),” said Nguyen Thanh Can, head of the troupe. Foreign tourists interact with the dancers, taking pictures with cameras and cell phones. 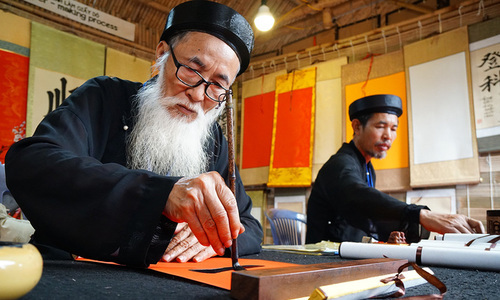 The 250-year-old temple is visited by hundreds of international visitors every day. 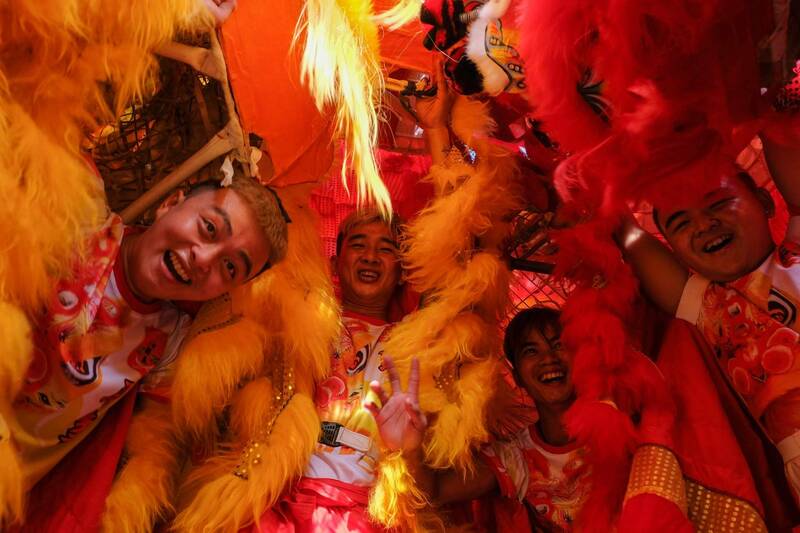 Performers of Linh Nghia Duong lion dance troupe are all smiles, excited before going on their performance tour. 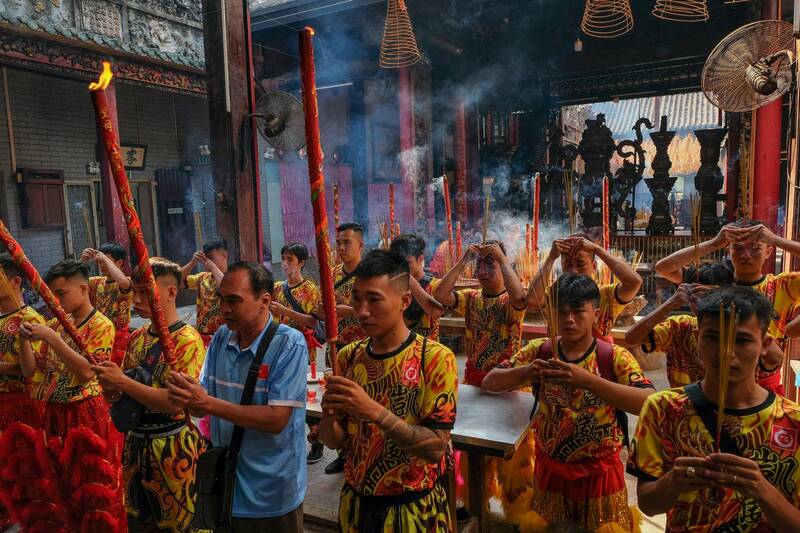 All members of Khai Uy troupe burn incense for Thien Hau, the seeking the Goddess’s protection and wish for a new year of peace, success and lots of luck. 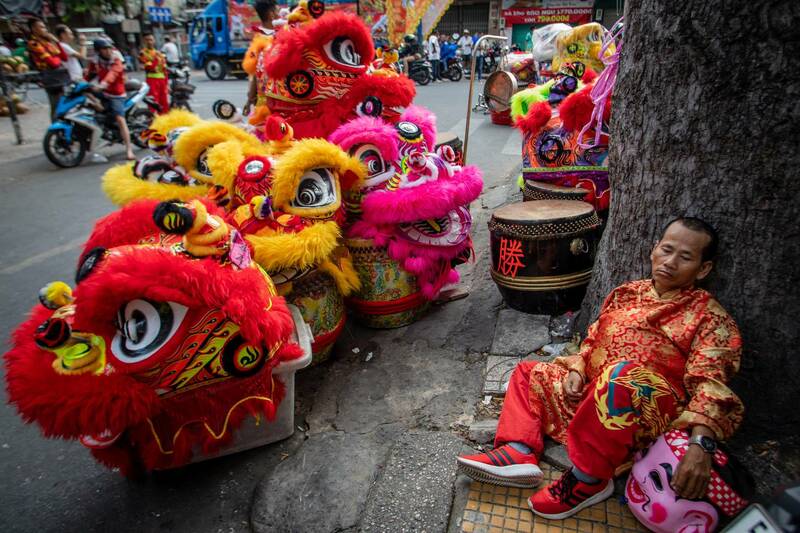 A performer disguised as Than Tai, or Caishen, the Chinese god of prosperity, accompanies with a lion dance group performing in front of a bakery on Nguyen Trai Street in District 5. 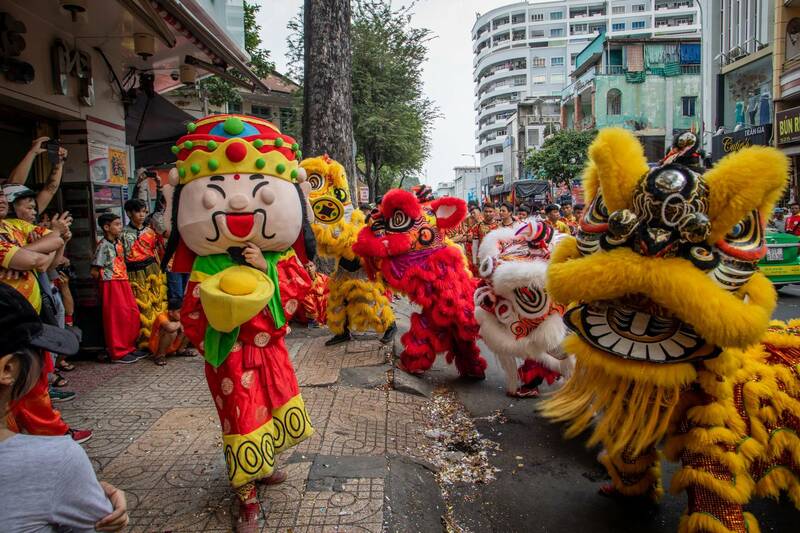 Many Chinese and Vietnamese people credit their business success and happy life to divine blessings, and for this, every family invites a lion dance troupe to visit their houses and business establishments on the first days of the New Year, and give them a lucky money envelope. 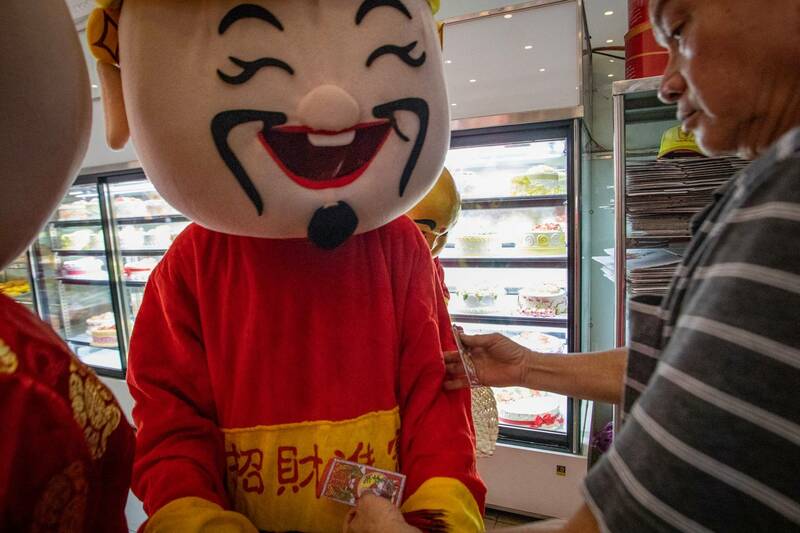 The bakery owner gives lucky money envelopes to members of the troupe. 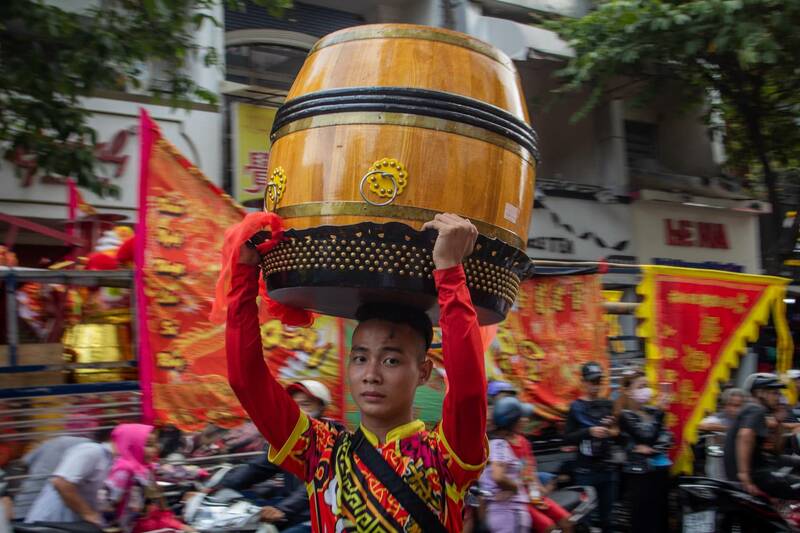 A lion dance performer carries a drum to truck, getting ready to start the performance tour that lasts throughout the festival days. This year, the New Year falls on February 5. The nation is enjoying a nine-day break (February 2 -10) to celebrate the festival. 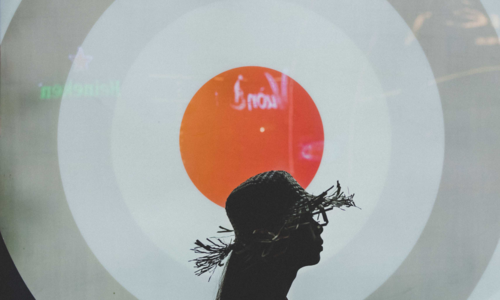 After two hours of performance at the Thien Hau Temple and shops on Nguyen Trai Street, Nguyen Anh Tuan, who dresses up as Ong Dia, (The Spirit of Earth), takes a short nap on the sidewalk.